flame to fork: Natural Skin Care Testimony & Coupon Codes! Natural Skin Care Testimony & Coupon Codes! Hi! Tonja here! I know this is a long post, but I felt a lot needed to be said since Clare and I both get a lot of questions about exactly why and how we do stuff… but stay tuned because at the very bottom is a link and coupon codes for the products I credit the most for giving me skin that I can wear bare on a daily basis! I was never the kid in high school who struggled with acne. I got a zit here or there, but it certainly wasn't the biggest problem I dealt with (let's talk poor taste in clothes and mile-high hair). However, something happened in my mid-20's and for the first time in my life I could not get acne to stop erupting. It mainly hung out on my cheeks and chin and at times would be cystic-like and painful (I have the scars to prove it). Fast forward to the past couple of years and now you add acne that remains below the surface and then persists as a bump on my skin for weeks on end... only to turn into a dark spot once the bump was gone. I am in my MID-THIRTIES!! What the frickin' heck!? It's been over 2 1/2 years since I took the Paleo plunge, and I'll admit, my love of cheese and dairy helped the acne problem persist. But even when I did Balanced Bites' 21-Day Sugar Detox in January of 2012, I still came out with zits, zits, zits. Nothing was working. It wasn't until around October 2012 I realized that perhaps my INSIDES weren't the only thing sensitive to toxins, but my OUTSIDES too. I threw out all my skincare and make-up products after reading Cave Girl Eat's blog post on the oil cleanse method. I wasn't going to worry about sunscreen, anti-aging, pore cleansing, this or that... I wanted a SKIN DETOX. As in Cave Girl Eat's post, I made a concoction of castor oil and grapeseed oil (I only used grapeseed oil because I had bought some and then realized I shouldn't be eating it). I did 20% castor oil and 80% grapeseed for what I consider combination skin. I applied some on my DRY face and rubbed it in and worked it through my eyelashes to remove mascara. I then soaked my Norwex cloth in hot water and applied it on my face for a few seconds and then rubbed in the oil more. Last, I rinsed my Norwex cloth and wiped off the oil and make-up. Right away I saw results. For anyone freaked out about applying oil to what they think is oily skin... DO NOT BE AFRAID. I was that girl who had to use those oil sheets to soak up the oil on my forehead and cheeks in the afternoon - I was an oil factory. Within a few weeks my skin normalized and I have absolutely no need for those sheets anymore! 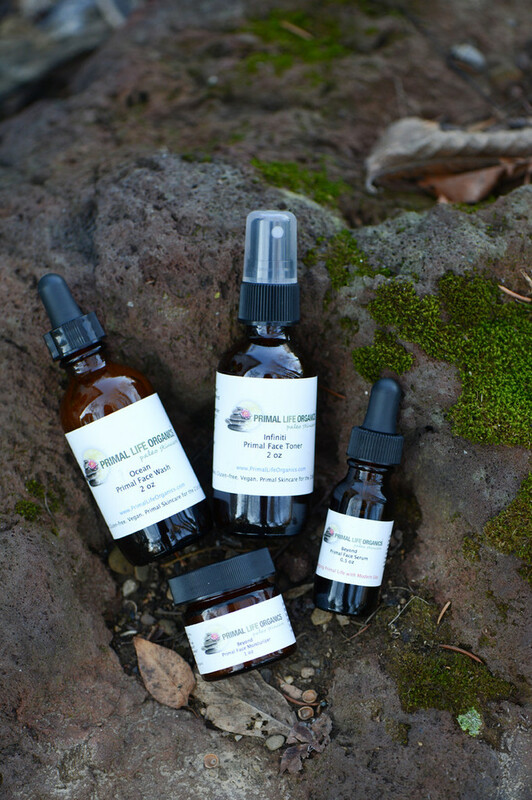 Then Trina of Primal Life Organics offered a deal for Black Friday - at this point I was ready to add in some additional natural products to see how my skin reacted. 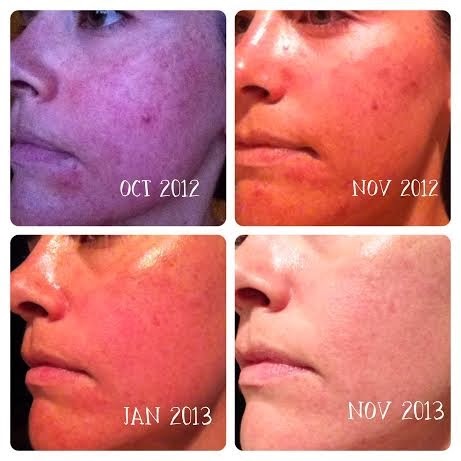 It had been purged of all the toxins in my prior products, so I was starting with a clean slate! She suggested I start with the Infiniti and Beyond Primal Face Package and then rotate between that one and the Infiniti Primal Face Package. I bought it right away and couldn't wait for it to show up! Once it did, I started introducing the products slowly - first just using the face serum and toner. Then occasionally adding in the cleanser and then I rotated between the Green Pastures Beauty Balm and her moisturizer in the evening. Aaaaand.... here are my results over the past year. My skin has lost most of its red patches, which I am guessing was irritation from harsh chemicals and it's so much smoother. But the best part is, no cystic acne since I started and the persistent patches just below the corners of my mouth are GONE! I also have suffered for many years from melasma that persists as dark patches under my eyes/on the top of the cheekbone and my upper lip. Since using Primal Life Organics - I am guessing the serum - those have faded significantly as well! 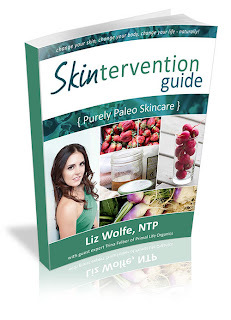 Liz from Cave Girl Eats wrote the Skintervention Guide and Trina from Primal Life Organics contributed - this guide has been invaluable in my quest to continue improving my beauty routines and also to continue to learn how to use quality food and ingredients to make my hair, skin and nails look the best that they can. Find out more about this guide and purchase it, go here. LAST, but not least, Trina is doing ANOTHER special to coincide with Black Friday so YOU can try it out much like I did, but it starts at 6pm EST on Thanksgiving Eve! Use the codes below to save money - this is a GREAT time to take the plunge or purchase some stocking stuffers for others. Make sure to pin this link and jot down the coupon codes. Friday November 29: “PLO holiday” gives you 20% off your entire order. Saturday, Sunday and Monday (November 30- December 02): “PLO Christmas” gives you 15% off your entire order.